Just approach one of the participating statues, locate the sign and scan in the QR code or type the address into your browser. The statue will call you back and give you a short lecture on who they are, what they’ve accomplished, a description of the statue and/or more. The speakers are all Chicagoan’s or affiliated with Chicago institutions. 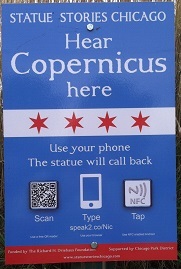 You can try it with Copernicus in front of the Adler Planetarium. Type speak2.co/Nic into your browser. 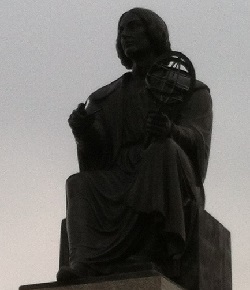 It’s more fun if you’re actually at the statue. 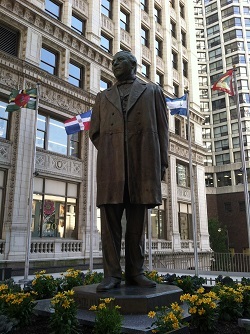 Benito Juárez, Plaza of the Americas, Just north of the Wrigley Building. I couldn’t find Benito’s sign. Find all the statues here. Bob Newhart, Navy Pier speak2.co/bob Speaker: Bob Newhart (He went to Loyola). CLOUD GATE, Millennium Park speak2.co/cloud Speaker: David Schwimmer. 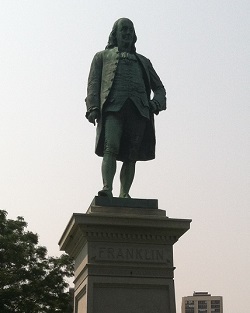 Thank you so much for this statue tour post and the related links to the speakers. I was unaware of this project. Yes, listening while looking at the statue photos online isn’t as grand as standing near the statues but it is still interesting and I can share with non-Chicagoans who may not be able to visit or tour before August 2017 (or is it now 2018?). I can seek out my favorites and repeat the calls. I’m glad you found the post helpful. It’s another example of all the great (and free) things we have around the city hiding in plain site. The last I read they are extended through August 2017 so I’ve clarified the post. They’ve been here since August 2015. Enjoy!